Overhead Calculations Suite (OCS) - routine overhead line calculations. Many software tools available to the industry try to cover every possible situation. In so doing, most of these tools are complicated and require training to be able to use them. The DSTAR toolbox is intended to be so simple that the average field engineer, designer, or technician could just pick up and go, intuitively, probably without ever reading the documentation or having any training. The Toolbox is implemented in Excel so that it can be easily installed. The Toolbox is intended to be customized to each utility by a "Program Administrator" who sets up data particular to the company and the materials it uses. The flexibility is with the Administrator, the simplicity is with the user, who sees lists of familiar materials, and needs only to click and go. This tool calculates guy tensions for the ordinary guy configuration or for span guys and sidewalk guys. The program also recommends guy materials to use for the specific application, and allows the user to easily iterate the design to achieve a good solution. The DSTAR Toolbox programs are designed for extreme user ease. Most programs can be readily used by a technician or engineer without even first consulting the manual. 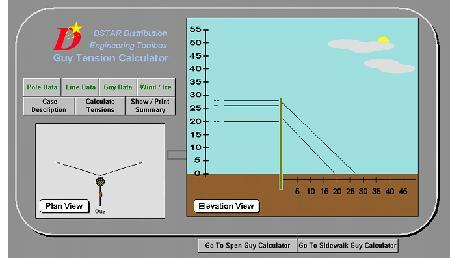 The Guy Tension Analyzer provides plan and elevation views of the design to ensure that the data "looks right". Also, in this digital age, users are attracted to tools which have features like this. An important feature of all the Toolbox programs is that the programs are easily customized to the materials and practices of the using company. The customization is set up by a knowledgeable engineer in the company. For the end user, the answer is just a few clicks away. Click here for more details on GTA. 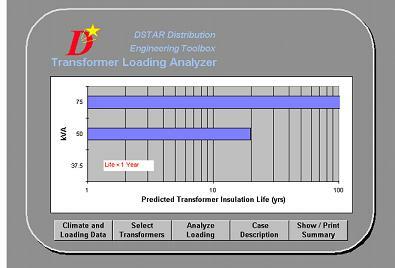 Another Toolbox tool is the Transformer Loading Analyzer. This is a simple transformer loading analysis tool used to estimate the service life of up to three different transformer ratings for a particular loading and ambient temperature scenario. While TOCS, is the heavyweight used for procurement and specialized transformer application issues, TLA is the quick-and-easy program which can be used by technicians, designers, or customer service agents to evaluate the size of transformer needed for an application. The program can be customized with the data for the transformers that a company procures and ambient temperature cycles for the various service territories. The input for the hourly transformer load has a graphic plot to assist the user. Ambient temperature profiles are set up by the Administrator for the various geographic regions of your operating area. The user need only select the appropriate climate, and the hourly temperatures are loaded for each season. Another Toolbox tool is the Voltage Drop and Flicker Calculator. 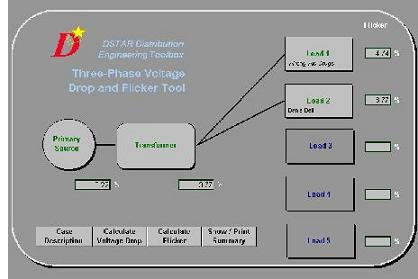 This tool calculates voltage drop and flicker for three-phase services where each customer or load is served radially by a separate service cable from the transformer. In addition, V-Drop can calculate the impact of large motor starting or other flicker loads elsewhere on the feeder. The user clicks on the graphic objects to enter data in V-Drop. Transformer and cable data can be selected from data set up by the Administrator, or the user can input data directly. V-Drop also allows the user to model the primary radial system back to the substation to determine the primary side flicker seen by other loads on the same feeder. Primary modeling is not mandatory, however, and the user can opt to define the primary impedance at the distribution transformer in terms of the short circuit strength, or choose to ignore the primary system altogether. Click here for more details on V-Drop. 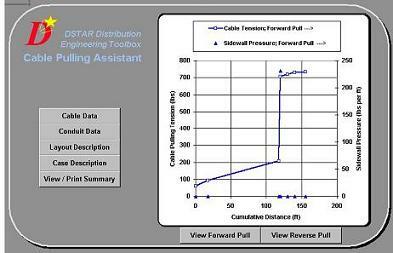 The Cable Pulling Assistant is a Toolbox program which allows user-friendly calculations of pulling tensions and sidewall pressures for a cable run. 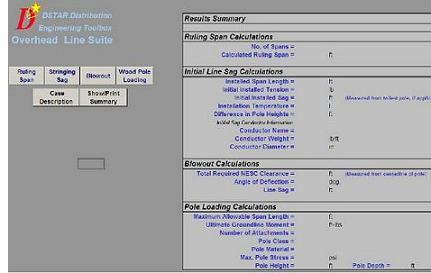 CPA also calculates the probability of cable jamming, conduit fill, and conduit clearances. As well as other Toolbox programs, CPA can be customized to allow the user to directly select the cables and conduits used by a utility. CPA handles up to three similar cables plus a neutral conductor in a conduit. Cables are selected from a database set up by the Administrator, or data are directly input. Then the program recommends a coefficient of friction based on the combination of the cable outside surface material and the conduit material. This table of coefficients is set up by the Administrator based on the lubrication practices used by the utility. A very handy method is used to input cable layout information. The user simply double-clicks on a row in the input table, and the window shown on the lower left opens. The user can select whether a straight, sweep, or field bend section is to be input, and a window is opened letting the user select the appropriate data from a list set up by the Administrator. A handy feature of CPA is that the calculations for pulling in either direction can be quickly obtained, without re-entry of the conduit layout data. Click here for more details on CPA. The overhead calculation suite is a pool of tools helping out routine overhead design functions. Click here for more details on OCS.